Nestling in the foothills of the Himalayas, within sight of the snowy 8,000-metre peak of Mount Kanchenjunga, is the town of Kalimpong. It used to be a midway trading town between Lhasa and Calcutta until Chinese troops moved into Tibet in the 1950s, and now it is a bustling place though perhaps less important than of yore. A couple of weeks ago I was there, visiting some friends but also accompanying an English (Cambridge-based) choir, Ishirini, that sings mainly a cappella works. While I was on this trip, I took the chance to get to know Tagore again. The choir had come over from Calcutta where they had given workshops at the Mathieson Music School and a concert, involving the school’s students, at St Paul’s Cathedral. In Kalimpong, they gave similar workshops at the Indo-Tibetan Buddhist Cultural Institute, a special school set up particularly to give the children of Tibetan refugees an environment where their own culture could be sustained. Most of the lessons take place in English – because that is the language they will need to do well in modern India – but they also learn Tibetan history, literature, language, customs and dance. In fact, the children – aged 4 to 14 – and the choir alternated performances: one Western work followed by one Tibetan song or traditional dance. (By the way, the school is supported by the English charity Karuna, whose patron is Judi Dench). Ishirini also performed at Dr Graham’s Homes, a missionary school in Kalimpong. Part of the inspiration for the choir’s trip was the work of Rabindranath Tagore, the great Indian writer, painter, philosopher and poet, a Nobel Prize-winner who was born in Calcutta and lived for some time in Kalimpong. This year is the 150th anniversary of his birth. 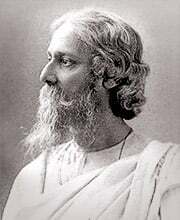 A new work was composed for the choir by Peter Allwood which draws on Tagore’s poetry, and it was sung by Ishirini with children from the schools singing words in the original Bengali. I mention all this partly (and in admittedly somewhat indulgent fashion) because I had a delightful and unusual time, visiting the schools and Tibetan monasteries. The Gelugpa monks of Tharpa Choling performed a long-life ceremony for the members of the choir, complete with cymbals, shawms and long Tibetan trumpets; and butter tea was served. In response, some of the monks came down to the town for one of the concerts so they could hear the choir: the works of Praetorius, Finzi, Macmillan and others were as strange for them (though just as fascinating) as the inimitable sound of Tibetan chant was for the choir. While I was on this trip, I took the chance to get to know Tagore again. I had read a little of his poetry. They Who Are Near To Me is on the Seven Ages poetry collection, and there are two short works on Poems of the Orient (originally released in 1998 but since deleted). We are now offering the two Tagore poems from this collection, read by Madhav Sharma, free this month. While in Darjeeling on the way to Kalimpong, I bought a copy of Tagore’s The Postmaster and other short stories. And I reflected on the classic world literature that is still out there for Naxos AudioBooks to focus on. Our first port of call has been European and American literature, of course, but there is so much else to do if we are rightfully to regard ourselves as the premier catalogue of classics on audiobooks. We have recorded two great Japanese poems (Bashō’s Narrow Road to the Interior and Chōmei’s Hōjōki); Spiritual Verses by Rumi; and various religious texts outside our Western sphere. But the world is getting smaller and culture is travelling so much more readily, and there is increased interest in world classics. The last time I was in India I read, for the first time, Tales from Malgudi by R.K. Narayan, which were so endearing: why, I wonder, has it taken me so many decades to encounter them. The Arabian Nights we know (listen to Philip Madoc’s hugely entertaining recording if you want a fun time! ); Khalil Gibran’s The Prophet and other stories has an enduring appeal; and though Rudyard Kipling’s Kim is part of English literature, it is such a fond reflection of India that I think it crosses international bridges, especially in the recordings by Madhav Sharma (abridged and unabridged). There is relatively little classic world literature on English audiobook, which I can see, in the wake of my recent visit to India, is clearly something that needs attending to!